The presentation of an individual dessert can be breathtaking! 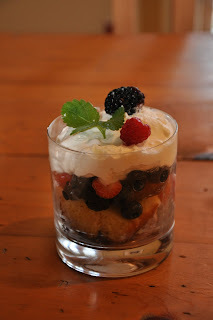 So when I saw this Berry Trifle on William Sonoma's website, I decided to make it in a petite form! 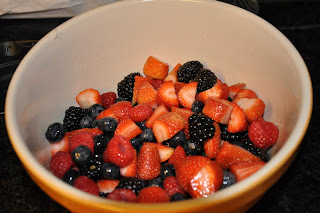 Berries macerated in orange juice and sugar. 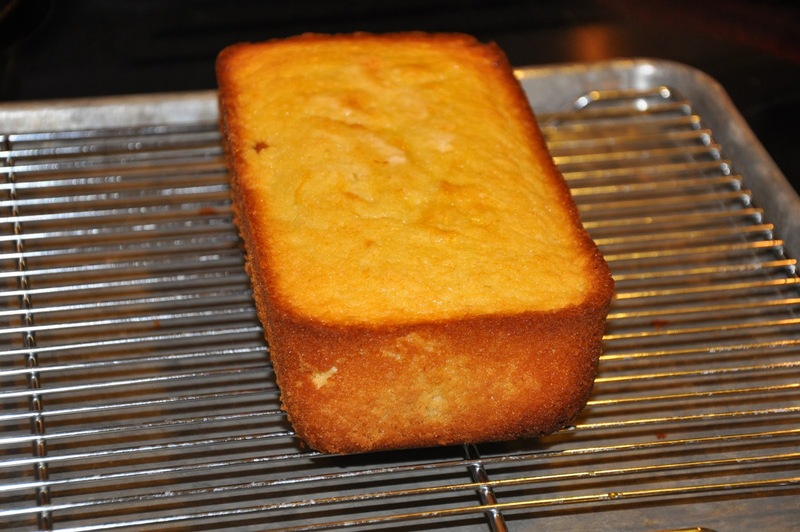 . .
a loaf of pound cake . . .
alternated with homemade whipped cream and topped with fresh mint . . . and . . . Viola! Now imagine this little beauty in a mason jar with cute ribbon tied around it to be enjoyed after a Fourth of July parade. . . oh the ideas. . . . Enjoy and have a lovely Friday! 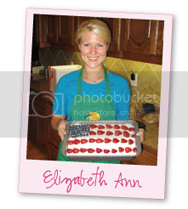 If using strawberries, hull and slice them. 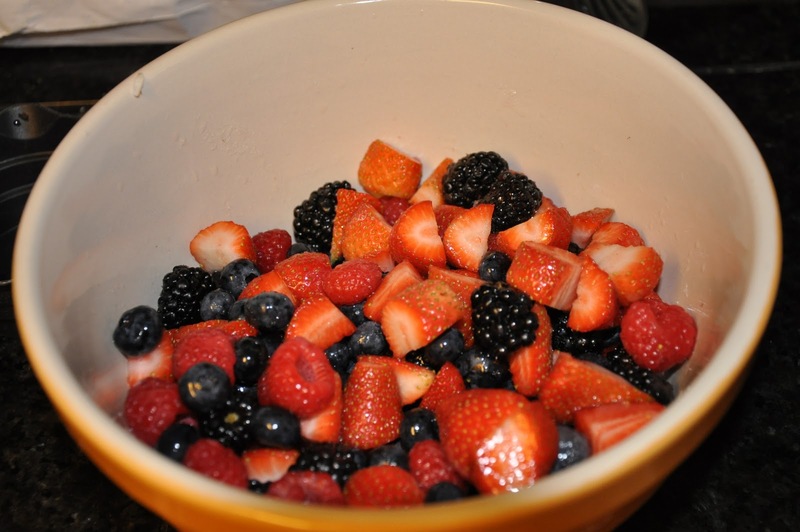 Place them in a bowl and add the other berries. Add the superfine sugar, orange juice and liqueur and stir gently to mix. Set aside to macerate for at least 1 hour or up to 3 hours. Cut the pound cake into 1-inch cubes and set aside until ready to assemble the trifle. You should have about 6 cups. 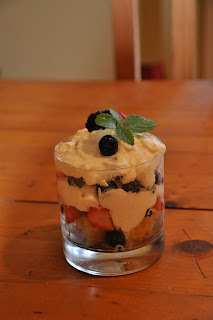 In a large bowl, using an electric mixer on medium-high speed, beat together the cream, confectioners' sugar and vanilla until soft peaks form, about 3 minutes. In a separate bowl, using clean beaters and with the mixer on medium-high speed, beat the mascarpone until soft. Using a rubber spatula, fold the whipped mascarpone and the lemon zest into the whipped cream until evenly blended.Select a footed glass trifle bowl 9 to 10 inches in diameter and 5 inches deep. Alternatively, use a large flat-bottomed glass bowl. Arrange a single layer of the cake cubes in the bottom of the bowl. Spoon one-third of the macerated berries over the cake and then spread one-third of the mascarpone mixture over the berries. 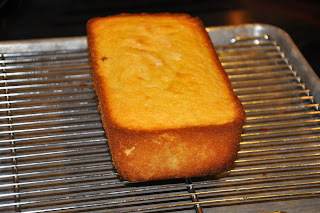 Repeat the layers twice, finishing with a layer of the mascarpone mixture. Cover with plastic wrap and refrigerate for at least 4 hours or up to 24 hours to allow the flavors to marry. 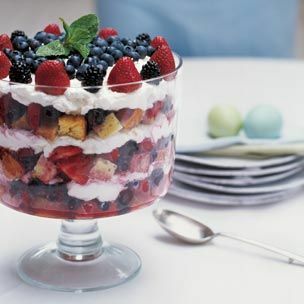 Just before serving, garnish the trifle with whole berries and mint. Serves 6. AH im going to be craving and thinking about this all day! What a beautiful and delicious dessert! Elizabeth! Of course I remember you...I've actually seen your blog through Abbi's, but I figured you wouldn't have remembered me, haha:) I'm a horrendous cook, but I'm hoping your blog will inspire me. And we'll definitely check out Parker's blog...thanks for passing it along! So cute! So what did you use...they kinda look like candle votives. I love them, so cute! 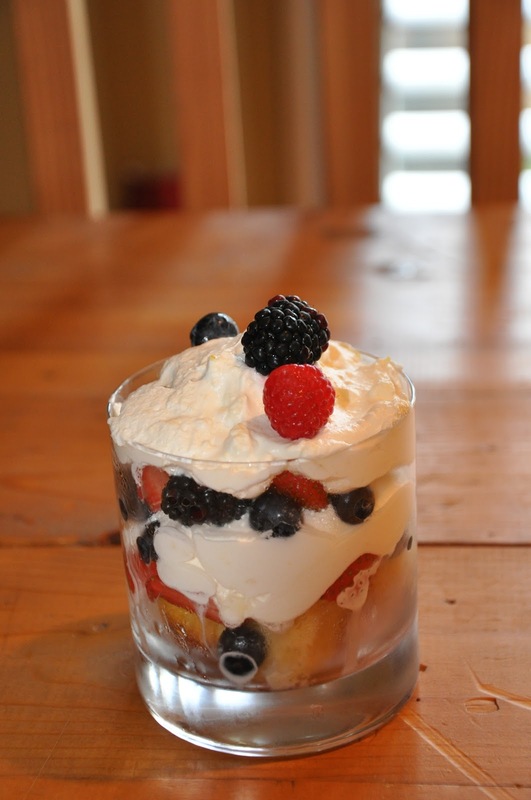 what a beautifl trifle! all that fruit looks so fresh! Congrats on the warrior dash!